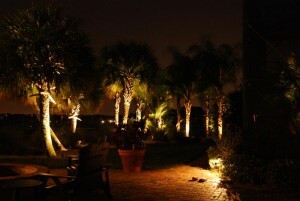 In addition to lighting up the dark space outside, there are several other benefits that come along with landscape lighting in Winter Garden, FL. When you make the decision to update or add landscaping on your property, you know that the process often requires a fairly large investment. However, as the sun goes down, the yard becomes dark and it is impossible to see the beautiful plants and other additions you have made to the outdoor space. Landscape lighting is the ideal solution to this common problem, and our team at A&E Electrical Services LLC is here to provide this service for you. In addition to lighting up the dark space outside, there are several other benefits that come along with landscape lighting. One of the major ones is security. When your property is well-lit, it is much less appealing for a thief to try to break into your home. An attempted break-in on a property that has landscape lighting is much more difficult because the intruder is likely to be seen by someone passing by on the street. This type of lighting also makes it safer for people walking around your property at night, since it minimizes the risk of tripping and falling if you can’t see where you are going. Landscape lighting is functional, but also looks very nice. It can drastically improve the look and feel of your home, while allowing you to showcase the landscaping in which you have invested time and money. It also allows you to take advantage of your outdoor space in the evening hours. Here in Winter Garden, Florida, we have nice weather throughout most of the year, so it is always fun to have family gatherings or meals together outside whenever possible. Give us a call at A&E Electrical Services LLC today to get started on your landscape lighting project!